At Goodridge we are frequently asked what makes our brakelines superior to our competitors. Goodridge stainless braided brakelines are the standard in professional motorsports where the ultimate in braking is required. With the largest application listing of any company and an unmatched reputation backed by champions worldwide, there is no reason to choose anyone else. • Feature – Every brake line made by Goodridge is 100% pressure tested. • Benefit – Guaranteed to be leak free and give an improved braking performance. • Feature – Every brake line made by Goodridge UK is 100% TUV, DOT, ADR and ISO approved. Some can even be processed as ABE. • Benefit – All Goodridge brake lines can be used worldwide. • Benefit – all fittings are designed and manufactured to fit every application first time, so no bending of banjo’s is required, or universal fittings that do not fit properly. 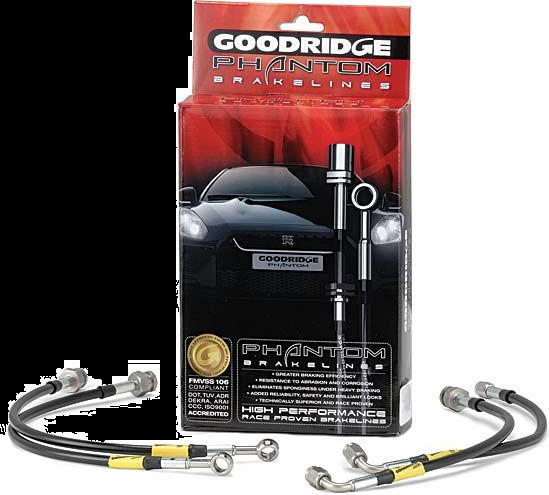 • Feature – Goodridge have been in business 45+ years and supply brake lines to over 25 OEM’s worldwide. • Benefit – All of our expertise of supplying world leading OEM’s, motorsport teams and aftermarket distributors over the past 45 years goes in to every brake line we make. • Feature – Goodridge employ over 300 staff worldwide with nine Goodridge locations and over 250 handpicked distributors. • Benefit – Unparalleled customer service and support worldwide.